It would be wonderful if all the previous network technicians and cable installers at your facility ran all the cables neatly and carefully labeled each one, but instead you usually end up with lots of cubicles, all having cable jacks with cables in messy bundles running to a server room. To locate a specific cable in that mess, you need to use a device called a toner. 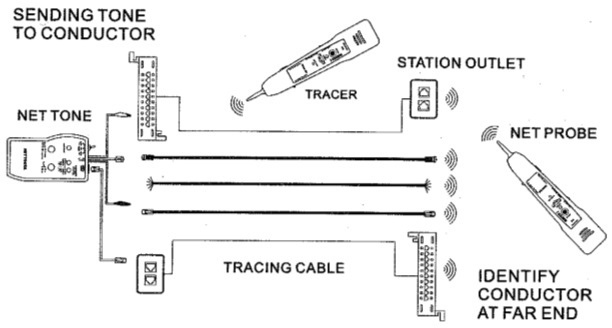 A network cable toner has two parts, the tone generator, and the tone locator probe. The generator usually has multiple connectors, RJ-45 for Ethernet, RJ-11 for telephone cable, and BNC for coaxial cable, along with a set of alligator clips. The process is to put the tone on one end of the cable, then use the probe to trace or pick up the tone at the other end of the cable. Never connect a tone generator to a live circuit. Always disconnect the cable from as much live equipment as you can. Plug the appropriate tone generator connector into a workstation wall connector, patch panel connector, or directly to the cable. Then go the suspected termination point of the cable and place the locator probe near the cable or cables. You can tap the probe on the wires of the connector to search for the tone. Most probes have a switch that allows you check the polarity of the cable wires. If you still can't locate the cable, most probes have a tracer setting that lets you wave the probe near a bundle of cables to pick up the tone without touching the cable. To use the tracer setting you may have to set the tone generator to the "High" setting. Remember, UTP cable wires are twisted to prevent them from emitting signals, and coaxial cable is shielded for the same purpose, so sometimes it can be difficult to pick up the tracer signal.